According to a study entitled "Sick of Sitting,” excessive sitting contributes to obesity, cardiovascular disease, type II diabetes, and several forms of cancer. As a way to counteract the problem, reducing sitting time is advisable. However, this would also mean converting your work table into a "standing desk," which could be expensive and complicated. Thankfully, there's an easier and more economical way of doing it. Introducing the stand up desk converter, a device that efficiently converts a part of your workstation to a standing desk. In this article, we'll provide you with a few suggestions for a standing desk converter, and a buying guide to help you choose the right one for you. Let’s get right to it. If you are looking for a stand up desk converter that’s specifically made for laptops, then this is one of your best options. Because it's mainly catered to laptops, the product doesn't have to accommodate other devices like external monitors, speakers, and keyboards. As a result, you have a very streamlined unit. The product is also very versatile. Because each leg has three joints that you can rotate and lock, this standing desk converter can morph into a multitude of forms. It can hold your laptop while you are sitting on a couch, lying on a bed or standing in front of a desk. The unit also comes with USB-powered cooling fans to help prevent your laptop from overheating. This one’s a standing desk converter that seems to work like magic. At its initial position, the unit seems like a regular tray. But, you can raise the top portion, and the legs will expand above its base, forming a raised desk. This can all be done in mere seconds. Also, there's no need to do any form of assembling. The maximum height is 15 inches and the minimum is 2.5 inches. Of course, you can choose to set the height in between the maximum and minimum. With a 32-inch by 20-inch workspace, it offers abundant space for your devices. In fact, this standing desk converter can accommodate two monitors. This is one of the best products to pick if you want something that consumes the least amount of space. Furthermore, the robotic-like arm makes it look high-tech and cutting-edge. The unit only needs to be attached to an edge of a table. From there, it can then hold a monitor, keyboard and a mouse through the unit's arm. This arm system also translates to great flexibility as you can adjust it up and down. You can "swipe" it left or right. In fact, you can easily swing out your monitor, keyboard, and mouse if you need more desk space. As a bonus, the unit's main stand comes with a USB plug for charging or powering other USB-based devices. This one’s a stylish desk converter with a lot more to offer hiding under the hood. It's a tray-to-standing desk type but loaded with premium features. For one, the unit comes with air cylinders that allow for smooth and gentle adjustments. It also comes with a spring-loaded bumper system that prevents mechanical shocks that might cause damages to your electronics. The maximum height is 32 inches. Even working at such heights, the unit stays stable thanks to the finely-designed legs and base. The unit comes with chamfered edges that allow for maximum hand and forearm comfort. The textured surface ensures that your devices don't slip or tumble needlessly. 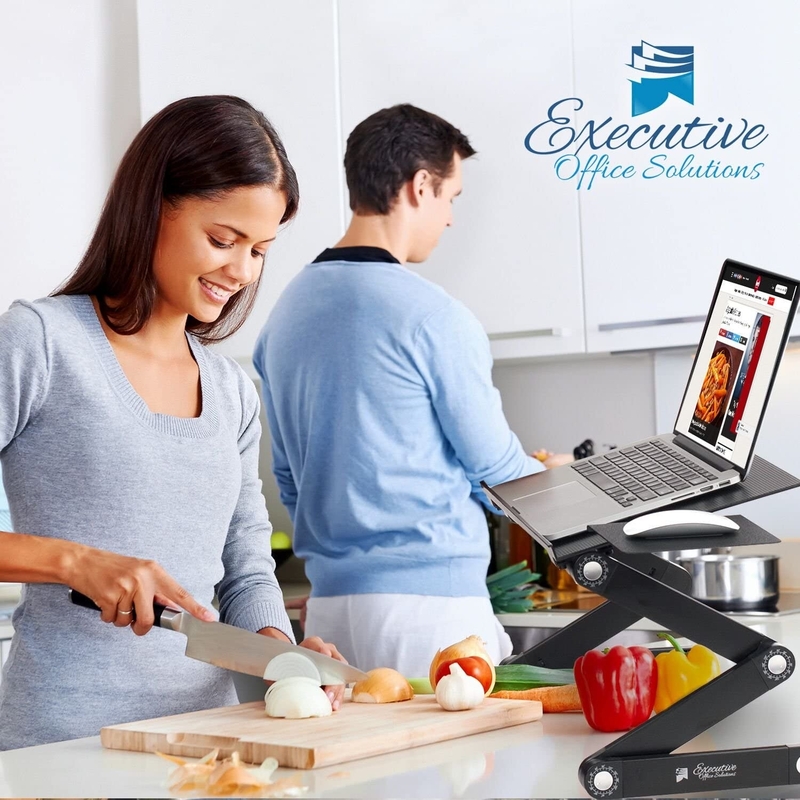 This standing desk converter is a product that is specially designed to lift your desk space effortlessly. The unit comes with a spring system under the desk area. Pressing a lever on the left side of the product releases the spring which allows you to easily, evenly, and smoothly raise the unit. This also means the product comes with great convenience as you don't need to unload your devices off the desk before making adjustments. The sixth product on our list is a stand up desk converter that features an excellent combination of style and functionality. The white finish, the natural colors of aluminum, and the sleek design allow the unit to exuberate an aura of simple sophistication. However, the aesthetic appeal of the unit is not the only thing that makes it an excellent choice. The product comes with a two-layered setup once converted to a stand-up desk. There's a layer for the monitor and another one for the keyboard and mouse. Such a configuration allows for great comfortability and ease. Another excellent feature is the gas spring that allows for easy adjustments. The spring helps with some of the lifting while the gas allows for a smoother and softer transition. This next product is a pull-up style stand-up desk converter that can offer you plenty of space. With a 31.5-inch by 20.5-inch of workspace, the unit can even accommodate two monitors with plenty of room left for other small items. The product is a two-layered system. This means there's a primary layer for the monitor and other items, and a separate layer for the keyboard and mouse. The unit comes with three height settings. The lowest comes at a height of 6.3 inches, while it can stand 15.6 inches when fully extended. Keep in mind that at its lowest setting, the unit doesn't become completely flat. Instead, it will retain its two-layered setup, which is ideal for some. The downside of a fancy stand up desk converter is the cost. In fact, the more elaborate it gets, the higher the final price will be. Some shoppers are merely looking for a stand-up desk converter that just works well without the fancy additions. If this sounds like you, then this unit may be the perfect one. Despite the lack of fancy features, it covers the essentials beautifully. It comes with a slim and sleek design, which works well with most office style. The height is adjustable, and the primary workspace area features plenty of room. It's also a two-layered system, making it excellent for the usual monitor and keyboard combo. This right here is a black stand up desk converter that works without the need for assembly of any sort. The unit is a two-stage system, which means it has a primary and a secondary layer. Also, the product comes with eight height settings, which is more than enough for most consumers. The primary layer features plenty of space. It can hold two monitors, a coffee cup and still have plenty of room to spare. The second layer can comfortably accommodate a keyboard and mouse. The unit is made from premium materials. The flat surfaces are made from wood, which is always a beautiful material for desks. The hardware is made from stainless steel, which is a notch above compared to the more common aluminum. The last product on our list is a stand-up desk converter that's primarily designed for portability and versatility. With lightweight materials and a collapsible setup, it's a unit that you can take anywhere conveniently. It's also flexible in a way that you can adjust the height and the tilt of the table. The legs are firmly attached to the underside of the table, preventing any wobbling. The anti-skid rubber on the feet and the mouse stopper on the desk only enhance its sturdiness. When fully extended, the desk can stand at 13 inches. Its lowest height setting allows the unit to stand at 9.5 inches. Apart from a standing desk, the unit can also work as a reading rack, tablet stand, TV tray or breakfast tray. When shopping for a stand-up desk converter, the first thing you'd want to avoid is falling into the trap of thinking that there's a perfect one for everybody. Every person has different wants and needs, and you'd want the one that can offer you more pros with the least cons. Having cleared that, it's time to cover a few of the finer details. As you might have noticed, the prices of stand-up desk converters vary widely. Hence, it's better that you start with a clear budget before checking a single item. If you do it the other way around, you'll likely overspend. Another important point to raise is to make sure you stick to your pre-defined budget. The height is arguably the most crucial factor that you need to consider when shopping for a stand-up desk converter. In most cases, a stand-up desk converter will be placed on top of a regular desk. Hence, measuring for the right height will also depend on the desk's height. Start by standing in front of the desk where you'll be placing the product. Then, raise your forearm until it reaches a 90-degree angle in relation to the upper arm. While staying at this position, you'd want to measure the distance between your hand and the top of the desk to obtain the optimum height. When shopping for a stand-up desk converter, you'd want to make sure that it comes with a height setting that can accommodate that optimum height you just obtained. Keep in mind that the 90-degree angle is what's considered as optimal. If arms and hands are at a higher angle, then you'll be placing needless weight on the stand-up desk converter. Such a scenario might lead to a collapse of the unit because of the extra weight. If the angle is lower than 90 degrees, then your wrist will be in an awkward and strained position. Staying in such a position will cause discomfort in the short term, and might lead to more serious problems (i.e., tendonitis, arthritis) in the long term. Another key factor is the device you'll be placing on the stand-up desk converter. In most cases, it will be a laptop or a monitor, keyboard and mouse combo. Typically, stand up desk converter are specially designed to cater one of the two. Of course, some units can cater to both. However, it will likely be more expensive when compared to a unit that specializes in one device type. The materials used can significantly impact the unit’s aesthetics, cost, and longevity. Thus, it’s a factor that needs more attention than most people would impart. The conventional materials used for making a stand-up desk converter are stainless steel, aluminum, wood, and plastic. Most of the time, a couple of material types are combined to produce a single unit. Below are a few quick points about the primary materials. Stainless steel - Durable, but can be expensive. Aluminum - Lightweight, but prone to scratches and dents. Wood - Very beautiful, but can be costly. Plastic - Very economical, but not durable. There are other factors that you may want to consider when purchasing a unit. However, never forget about the key points that are mentioned above as they serve as a foundation for making an intelligent purchasing decision.